UND Football coach Kyle “Bubba” Schweigert and UND President Mark Kennedy (right) are surrounded by celebrating Fighting Hawks players after they came from behind to stun the Northern Arizona Lumberjacks Saturday, Nov. 12, to earn the team’s first Big Sky Conference Championship in football in school history. 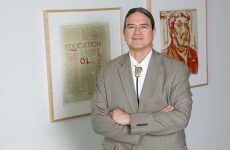 Photo by Shawna Schill. In a solid gesture of the OneUND spirit that is permeating the campus, UND head football coach Kyle “Bubba” Schweigert had more than pigskin on his mind when he addressed the media only minutes after his team captured the University’s first-ever Big Sky Conference football championship. That’s right. 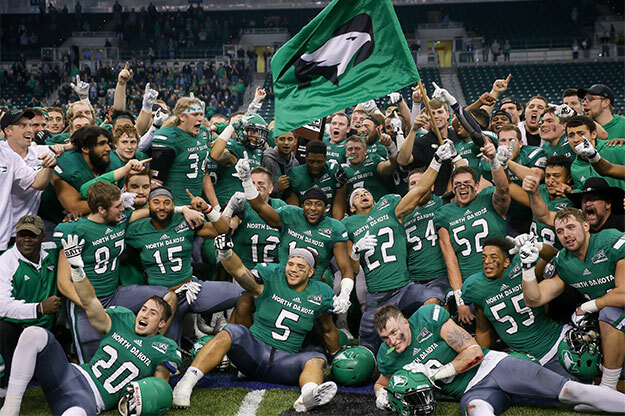 Schweigert wanted everyone to know that it truly was a championship Saturday for UND Fighting Hawks Athletics, as both its volleyball and football teams climbed to the top of their respective conference heaps to claim titles within roughly four hours of each other. It was the volleyball team that did it first, with a convincing 3-sets-to-none victory over the University of Northern Colorado Golden Bears, one of only two teams to beat UND in conference play earlier in the season. UND volleyball coach Mark Pryor recognized the fan support that turned out for its championship match and helped cheer his team to victory. 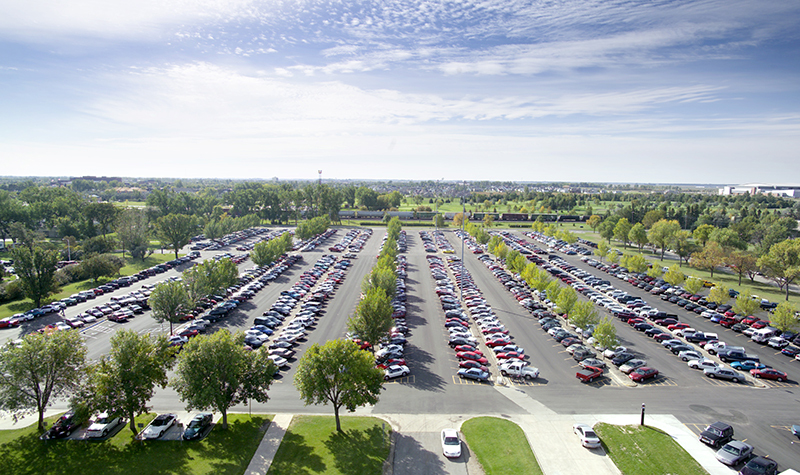 “Today’s crowd of over 1,100 was a huge deal for us,” Pryor said. His thoughts quickly turned to his volleyball squad and the achievement they had just realized. UND Volleyball players and coaches show who’s No. 1 as they capture the moment after winning the team’s first Big Sky Conference Championship on Saturday, Nov. 12, at the Betty Engelstad Sioux Center. Photo by Shawna Schill. The football team followed up the championship example set by volleyball with a thrilling victory of its own against the University of Northern Arizona Lumberjacks at the Alerus Center. 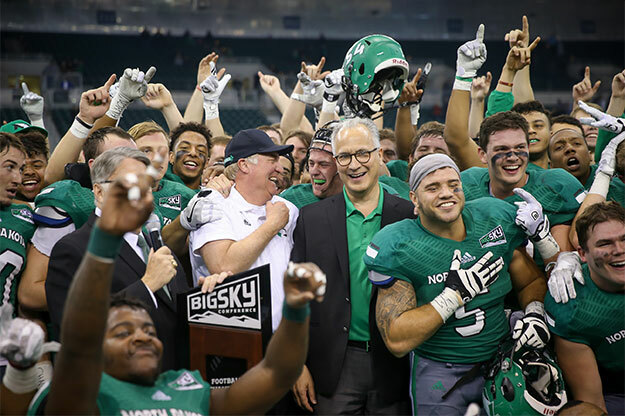 UND football was down 31-10 halfway through the third quarter of Saturday’s game before it rattled off 28 unanswered points to seize a 38-31 victory and the conference championship. No points loomed bigger than those when UND junior cornerback Deion Harris plucked an interception and dashed 40 yards for the go-ahead touchdown with less than five minutes in the game. The championship victories gave UND volleyball the right to host the Big Sky Conference Tournament at UND’s Betty Engelstad Sioux Center, starting Thursday. As for the football team, its win solidified its hopes of being selected for the NCAA Division I football playoffs for the first time in school history. UND Football players wave the Fighting Hawks flag after capturing a Big Sky Conference championship at the Alerus Center on Saturday, Nov. 12. Photo by Shawna Schill. 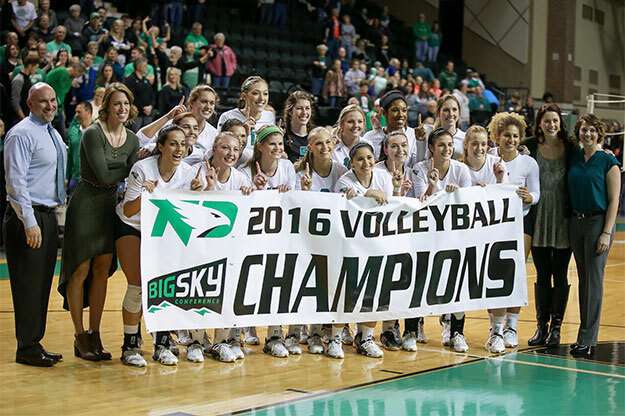 With Saturday’s victories, the volleyball and football teams join the 2013 women’s basketball team as the only UND teams to win Big Sky championships since the University started playing in the league in 2012. Coach Pryor had a lot of people on his mind that he wanted to acknowledge for helping to make UND volleyball such a powerhouse in the Big Sky Conference and the region. He recognized his current coaching staff: Erin (Joki) Green, Mia Tabberson, Natalie Thomas and Maumi Ogi. He also brought up a name from the recent past: his predecessor, Ashley Hardee. Chelsea Moser, from Willamina, Ore., who wound up at UND largely because of the recruiting of Hardee, capped off her senior regular season with a championship on Saturday. Moser, the team’s only senior, had developed into the heart and soul of UND volleyball over the past couple of years and had experienced many highs and lows.